Martian Manhunter and Stargirl appear to be the only heroes unaffected by the Crime Syndicate’s prison, formed out of the Firestorm matrix, tailor made to distract each of the super heroes. Last issue, J’Onn went to explore the prison, while leaving Stargirl behind. 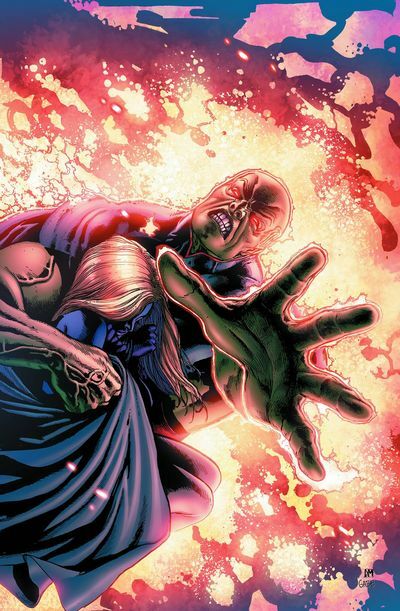 The pair remained in telepathic contact, but in this issue that connection is severed as both heroes encounter the horrors within. Unfortunately, there’s a bit of redundancy with the last issue. My least favorite “jail cell”– that of Simon Baz– gets further embellished. Meh. Then we see Stargirl encountering Wonder Woman’s prison which was already depicted last issue. I found it a little irritating that Stargirl reacts as if this is her first time seeing Wonder Woman, when they have already been in each others’ presence in prior comic books. The other major part of the story is that we get flashbacks to Stargirl’s origin. It’s slightly different from the original story from Geoff Johns’ ‘Stars and S.T.R.I.P.E.’ series. (For one thing, there doesn’t appear to be a S.T.R.I.P.E.) But it’s Courtney’s very nature that is revealed to be what saved her from the Crime Syndicate’s prison. There are even a few fun throw-backs, including a hint to the prior Captain Marvel/Stargirl romance in the last ‘Justice Society of America’ series. There is an attempt to tie in ‘Justice League Dark’ which is nice but feels half-hearted. The pencils by Tom Derenick reminded me a lot of Jerry Ordway’s work. Basically that it’s perfectly fine, but not extraordinary. That’s not a jab, it’s just very average but does the job, so there’s nothing to complain about. There are a few tiny continuity gaffes. In the flashbacks, Stargirl’s costume is baggy and her shirt is knotted in the front, whereas in the present, her costume is form-fitting. It, unfortunately, flip-flops a few times. It’s not a glaring mistake, but when the time shifts so much, it doesn’t help a reader keep track of when the panel is actually occurring. But overall, this issue felt a little stagnant and touched on too many elements from the previous installment. It’s certainly not bad, but with such a huge storyline as ‘Forever Evil’ you kind of go in expecting things to move a bit more briskly.